Location Map - Abu Dhabi Plaza Complex, Abu Dhabi City. Abu Dhabi Plaza Complex, Abu Dhabi City. Abu Dhabi Plaza complex contains two towers, tower 1 is the Hotel Tower operated by Gloria Hotels a four star phenomenon. The second tower is a mixed use tower comprising of 18 floors, floor 1 to floor 8 are offices and from floor 9 to 18 are residential apartments, ground floor/mezzanine floor is occupied by the showroom and retail areas all of which are positioned in the prime location. The prime location for Abu Dhabi plaza adds magnificent value to the tower as Abu Dhabi plaza complex has easy access to all places in Abu Dhabi, connected to the Main Streets in Abu Dhabi like-Corniche Street-Hamdan Street-Salam Street-surrounded by main Government Departments like the Oil and Gas Companies, Economy Ministry, ADIA-Abu Dhabi Investment Authority, Arabtec Headquarters and so on. In Abu Dhabi plaza complex, you will find yourself drifting into a world that moves at its own swiftness. Switch off from the monotony of your busy life and treat your senses to a delightful journey created as an ideal getaway for the mind, body and soul- Abu Dhabi plaza complex apartments and offices is just a call away ! The Tower consists of total 18 floors in Abu Dhabi plaza complex. This building contributes variety of luxury living options such as one and two bedroom units which include residential floors (9th floor to 18th floor) for rent. Commercial floors include small to medium size offices (1st floor to 8th floor) Abu Dhabi plaza complex surrounded with the community amenities that makes the place the best to live in. The fact that the building is in the center of Abu Dhabi city makes it unique and in high demand. Close access to the Central Market, Corniche and all other places in Abu Dhabi. The Hotel Tower is simultaneously next to the offices. This is an advantageous factor to the offices to conduct meetings and seminars in a professional manner. Apart from Gloria Hotel there is also Millennium Hotel and Royal Meridian Hotel besides the Abu Dhabi Plaza Complex. 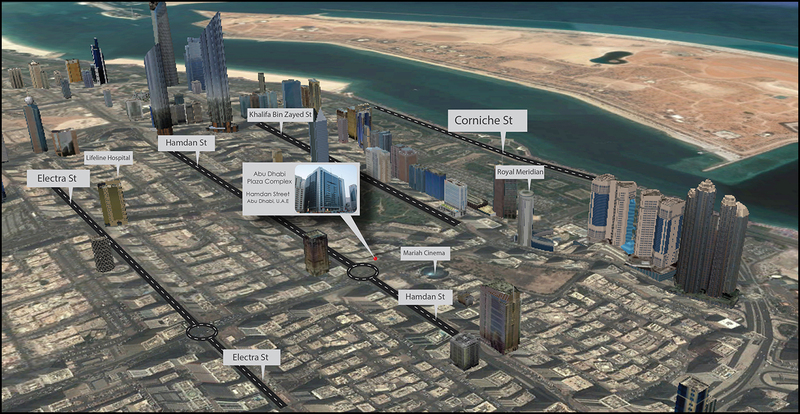 These key access points and connectivity factors makes Abu Dhabi Plaza Complex a necessity and prime requirement embraced by masses. The underground parking will be a commendable facility for the offices as each office will have allocated parking according to the size of the office unit. There is also availability of Mawaqif Parking which is available anytime around the surrounding areas. Completion April 2014 and ready to move in! Tawtheeq process for Abu Dhabi Plaza Complex has been approved by the Government of Abu Dhabi. Tawtheeq process for Abu Dhabi Plaza Complex has been approved by the Government of Abu Dhabi and now Abu Dhabi Plaza Complex is fully accomplished. Register is maintained by the Abu Dhabi Municipality (ADM) in electronic format. PSI is the exclusive agent for Abu Dhabi Plaza Complex. As we strive to help you, we extend our warm support to you and your loved ones to experience luxury and pursuit of comfort that Abu Dhabi Plaza Complex has in store for you!